She started by identifying access issues for children in Australia. She said that Australia's network was slow. 90% children 5-14 years old have access to the internet - but that means that 10% do not. As in other countries, low income families are less likely to have access to the internet. If children in low income areas need to use the internet for homework, then they may have to find somewhere that has free wifi, particularly a problem in rural areas and where public transport isn't good. Similarly, low income families will have older/cheaper devices, which may disadvantage children who are expected to bring their own devices to school. Another issue is whether parents join in communal activities around computers (e.g. games and Minecraft), or whether the child uses apps by themselves without social interaction. Danby highlighted some research on very young children and web searching. She mentioned Australia's early years learning framework, that included technology and use of digital technology for information seeking and play. However there is still ambiguity about this use. Danby briefly described some of her own research, in which they surveyed teachers, observed children at home and at school, and then the final phase will be a survey of teachers. There is also a 3-year longitudinal study of 6 families (with young children, 3-5 years). Through the projects they are aiming to understand childrten's use of technology in terms of social interactionsand daily practice. From the teacher survey, about 80% gave access to computers (though less were connected to the internet). Although the teachers had positive beliefs about the place of digital technology, only a minority (for example) discussed finding information in class. The teachers appeared to struggle to know how to incorporate use of digital technology in the classroom. By the way, Danby put a lot of information on the screen, and I could only capture some of it. She gave a couple of examples of something prompting a web search (e.g. a child having a tick, leading to discussion in class, then a search at break time, which gets documented as an activity). Another example was a child discovering a caterpillar, leading to an unsuccessful web search, then a digital photo sent to an expert, then an ongoing search for information, interacting with actual observation of the caterpillar pupating, becoming a butterfly, and the teacher and child seeking out more caterpillars of the same species. Danby showed us a video recording a teacher with a child trying to identify the tick that she had, looking at the ways in which the teacher and learner interacted, and the assumptions being made about the child's knowledge. Further video clips showed children exploring google streetview, playing with what can be done on the screen, and talking about themselves in relation to a location they have been, and then interacting with each other, screen and mouse to find a place on google maps. Another example, of a Sunday morning in bed, a father was taking the two young children's digital interactions for granted and asking them questions about what they were looking at e.g. the older child looking at pictures of the planets and the sun. In another video clip, a father was scaffolding a child in working through a search problem (encouraging, querying and guiding). Therefore in these examples the focus is on "talk in practice", how the teachers, parents or peers are interacting with the child and the device to problem solve, and whether or not they are scaffolding students' progress and giving them agency. This talk was also interesting in that to me these would fit as information behaviour studies, but undertaken by someone outside the IB community: there is a lot of overlap in terms of research questions and methods between the two fields. 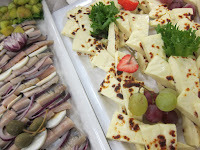 Photo by Sheila Webber: food at the reception last night.